E-Connect conference was the International Travel Bloggers & Twitters Forum which feature an all star panel – Shannon Hurst Lane – Traveling Mamas & Cajun_mama, Wendy Perrin, Conde Nest Traveller, & Perrin Post Blog and Kim Mance – Go Galvanting & Travel Blog Exchange, chaired by Jamie Horwitz. 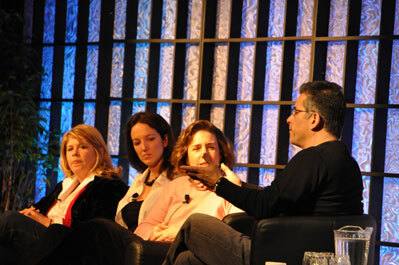 The panel provided first hand experiences how blogs can influence visitors in making decisions to travel destinations. Real people telling real stories and not a paid advertisement. The panel said how important it is to be open, honest, and authentic in telling your story. At the same conference, delgates were exposed to Tourisme Montreal and their five bloggers including Tamy. Ms. Maria Zin, Marketing Director,Visit Sweden, spoke about their Community of Sweden website – a social media site in which it encourages visitors to tell their stories, share photos, join a forum and more. Many of Canada’s provincial tourism sites now feature bloggers as they can see the importance of people telling their stories. Nova Scotia Tourism has – Discover a Nova Scotia favorite forum. Ms. Lesley Braby, Experience Specialist, CTC, spoke on success of the www.localsknow.ca website where canadians can talk about their favorites spots as well see videos.